A baked sweet potato is delicious! 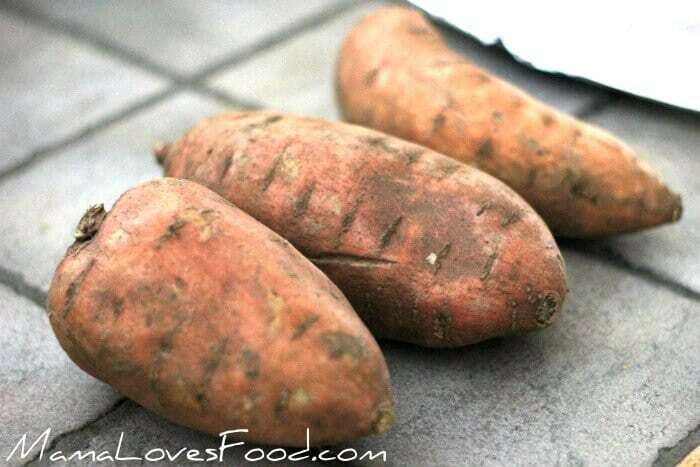 We will teach you how to bake sweet potatoes with this simple guide and they’ll be perfect every time! A baked sweet potato is one of my favorite treats. I learned how to bake sweet potatoes a few years ago and have nailed down the perfect process. And bonus it’s really simple to bake a sweet potato! I like to enjoy my baked sweet potato with some whipped maple butter and a steak salad. Mmmmmm. You guys, my mouth is watering. 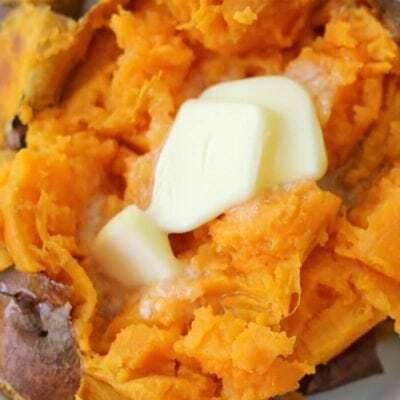 Sweet Potato – any size sweet potato works, but keep in mind the larger the sweet potato the longer it will take to bake. When I first learned how to bake a sweet potato I would do the biggest one I could find. But now I like to bake a smaller sweet potato, or several, so they don’t take as long. Oil – We are fans of olive oil, but butter, ghee, rendered bacon fat, coconut oil, or other vegetable oil would work too. What toppings to put on a baked sweet potato? 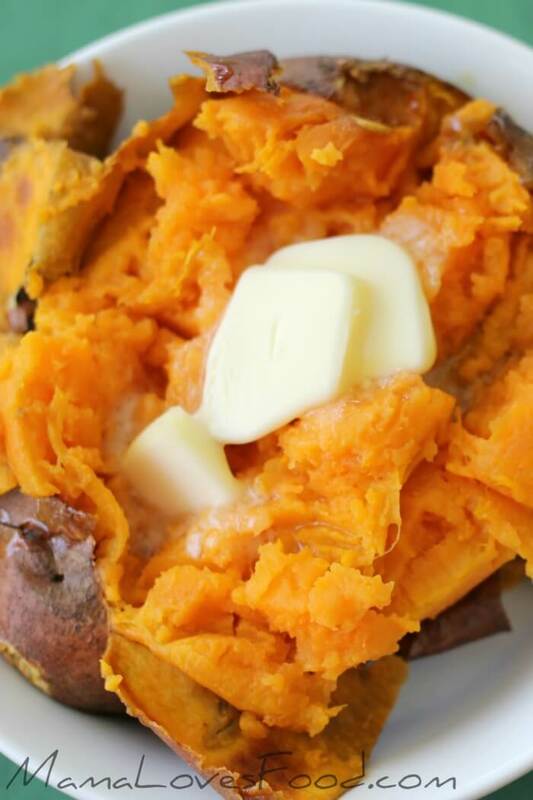 Traditional toppings on a baked sweet potato are cinnamon, butter, and even marshmallows! I am more of a savory baked sweet potato fan though, so I love a dollop of butter and some seasoned salt or a basic spice rub. Yum. Sometimes I’ll throw a scoop of Wendy’s chili or my favorite chili recipe (no beans) on top! 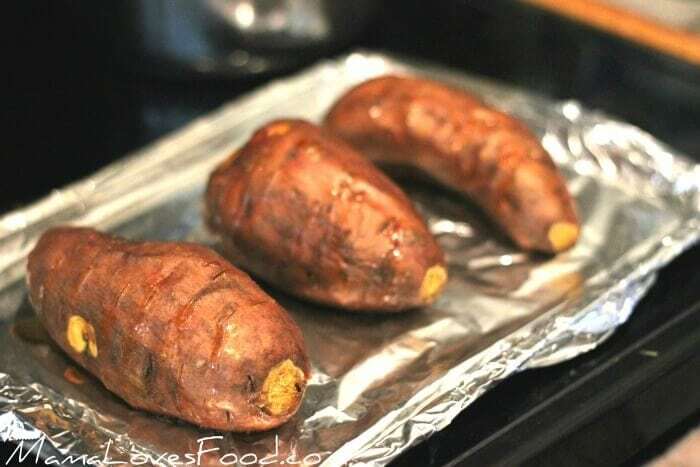 How do you bake a sweet potato in foil? In learning how to bake a sweet potato, I tried many methods, and while you can bake a sweet potato in foil, I actually prefer not to. When you bake a sweet potato without foil, the skin crisps up nicely, and I feel like it even cooks just a little bit faster. Not to mention, so much less waste if you’re not wrapping each sweet potato in foil. Sweet potatoes are very healthy, they contain high amounts of fiber, potassium, and vitamin A. And they contain more overall nutrients with fewer calories as compared to their Russet counterparts. Not to mention, a baked sweet potato will keep you full for a long time! Do you have to peel a sweet potato? You do not have to peel a sweet potato! In fact I do not recommend peeling a sweet potato before baking it. All that does is remove nutrients and create more work for you. So I will say definitively, don’t peel your baked sweet potato! Vegetable Scrubber – Vegetable scrubbers are an easy way to get your veggies clean! I also keep an extra one on hand for scrubbing my sink. Don’t worry, I never use the sink scrubber for vegetable cleaning! Ew! Baking Sheets – I love my giant baking sheets and you see us use them on the live show all the time. You just can’t beat that kind of surface area. Silicone Baking Mats – You guys. Nothing sticks to these. Nothing. Literally. In the literal sense of the word. Get you some and thank me later! Salt Grinder – There’s something weirdly satisfying to me about grinding salt. I’m basically a pioneer. Be like me. Grind salt and be awesome. A baked sweet potato is delicious! 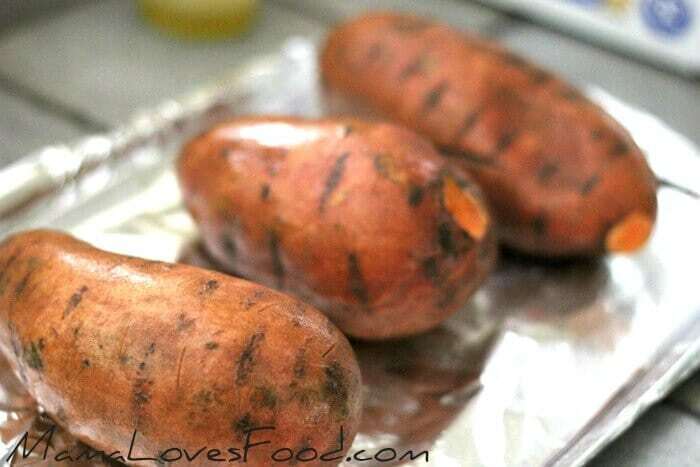 We will teach you how to bake sweet potatoes with this simple guide and they'll be perfect every time! Scrub potatoes with cold water. Dry and set on a foil lined baking sheet. Poke lots of holes in your taters with a fork or paring knife. Be careful, these bad boys are dense. Rub potatoes lightly with oil (and optionally sprinkle with a little bit of seasoned salt). Bake at 400 degrees for 40 -60 minutes (depending on the size of your potatoes). Serve with a pat of butter and sprinkle of cinnamon. Bookmarking this recipe because everyone at our house loves sweet potatoes and I’m always looking for recipes. Trying the curry soup next! I love sweet potatoes, so much more than regular potatoes. I also very gently wash mine. They come out perfect every time!